High school athletics can be one of the most beneficial aspects of a student’s education — but injury can cloud the experience. In recent years as coaches, medical professionals, student-athletes and parents have all grown more aware of the potentially life-altering impact of concussions, they have made moves to improve students’ safety. Last Friday, The Center Foundation hosted its second annual Blue Jean Ball fundraiser at Tetherow in Bend, raising tens of thousands of dollars to support The Center’s program of concussion baseline testing, injury assessment, and the stationing of qualified athletic trainers at Central Oregon’s high schools, including Sisters. The Blue Jean Ball featured a live and silent auction and paddle raise with a Western theme accompanied by the Central Oregon band Dry Canyon Stampede. A cadre of athletes from Sisters High School turned out to support the event. 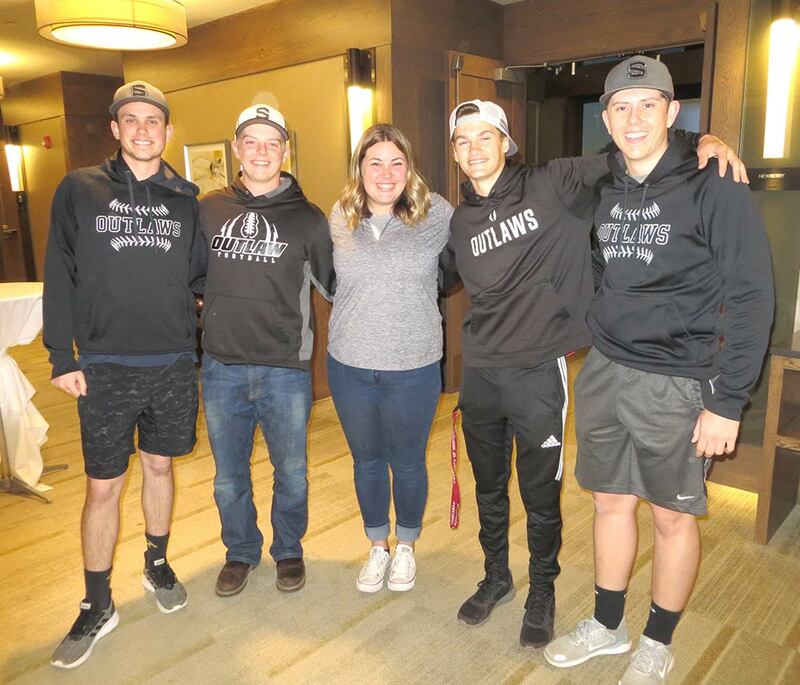 An Oregon law named Jenna’s Law in honor of standout Sisters athlete Jenna Sneva, who suffered severely from multiple concussions, formally legislated against immediate return to play after a concussion. This has reportedly resulted in a marked decrease in the number of students developing Second Impact Syndrome. “The ultimate goal is for no child to ever have a secondary concussion, because that’s when it can become really dangerous and potentially fatal,” Sonja Donohue, The Center Foundation’s executive director, told The Nugget. The frontline of defense against concussion is provided by athletic trainers. Stuart Schmidt is the supervisor of the athletic trainers in the Central Oregon schools. He was the trainer at Sisters High School from 2008 to 2010. Schmidt noted that, while football obviously carries the highest degree of concussion risk, an athlete can take an elbow on the basketball court or have a collision or hit the turf hard on the soccer pitch. A wrestler could be concussed in a fall or a volleyball player slammed on the hardwood. Trainers are on hand to assess the situation and act as needed. If a player goes down and doesn’t get up, or gets up wobbly, if they’re not quite right on the sideline, the trainer has the background, training and experience to make an evaluation — and to act. “They’ll do a full evaluation to determine if they have a concussion,” Schmidt explained. If there’s any suspicion that there’s a concussion, the trainer will pull the athlete from the game for further testing. The trainer — not a coach or the player — makes the call. Alex Walker is in her fourth year as the Outlaws’ athletic trainer. She works at The Center in the mornings putting casts on arms and legs, then she heads out to Sisters for each afternoon’s practices and contests. Four years of five-days-a-week presence makes Walker an integral part of the athletes’ support at Sisters High School. When an athlete has a concussion, there is a strict protocol that has to be observed before they can get back into action. Schmidt would like to see parents and students made fully aware of just how extensive the protocol is. To get back on the field, an athlete who has experienced a concussion must be asymptomatic for 24 hours; back in school full-time with no accommodation; have had a post-concussion test within normal range based on their baseline; gone through a gradual exercise progression over several days; and — critically — they must be cleared by a physician. The days of “toughing it out” are over — and coaches, parents and athletes are getting it. “Overall, I think in my time as a physical trainer, awareness has improved,” Schmidt said. While concussion evaluation is the most important role of the athletic trainers, it’s far from their only role. They deal with all the commonplace sports injuries and provide coaches with preventative protocols for stretching and warm-ups. “Whatever coaches feel like they’re missing, we try to insert that,” Walker said. It’s clear from the relationship the students have with their trainer that it’s about more than taping ankles and providing ice packs. “We’re there to support them when they’re injured and when they’re not injured,” Walker said.